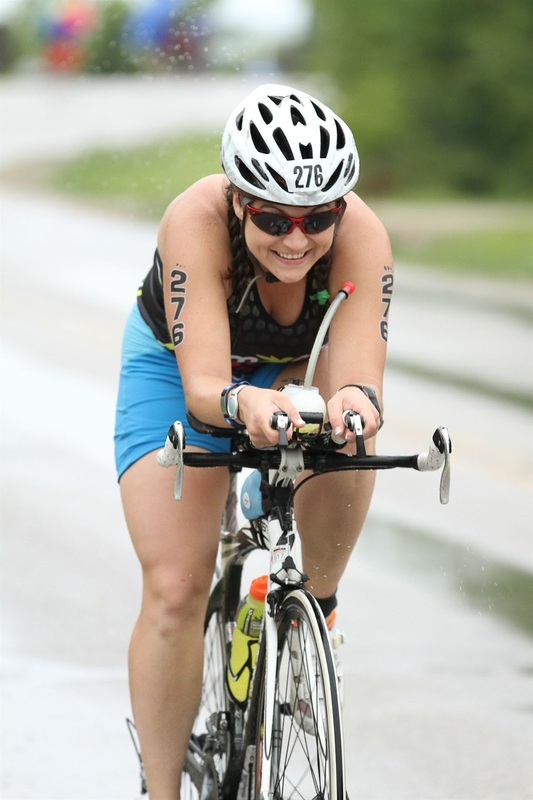 I had a great time last year at the Door County Triathlon and when Kelly mentioned doing it again I was in. It was a few weeks out from Ironman Wisconsin and I figured it would be a great tune-up race. 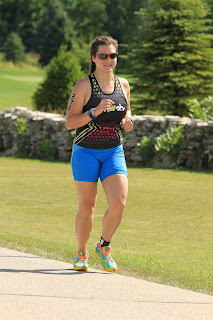 Plus Door County is beautiful and the race director puts on a great event. On Saturday after a quick bike ride and swim, Kelly and Brent picked me up at my house and dropped off their dog with dog-sitter Matt. Yup Matt missed out on Door County this year. He was going to a concert/music festival so he skipped. Instead he was relegated to watching all the dogs. After a quick stop for lunch we continued on our merry way to Door County. We headed straight to the race sight to pick up our packets. Pickup went quickly as there was no lines and we even got an update on the weather situation for the race. Weather = bad bad forecast. A very large thunderstorm was predicted for Sunday morning. We just crossed our fingers that things would work out. The rest of the afternoon and evening was spent grabbing some groceries for our cabin, getting some great pizza, and going to bed ridiculously early. The camping situation this year was upgraded to a cabin from our tent camping last year. And with the impending storms I couldn't be more grateful for that decision. Sunday morning we woke up at the normal-ish hour of 6 am. One look at the radar and I just laughed because it showed a massive storm headed our way. But continue on we must, so we loaded up all our gear (except my swim cap, d'oh!) ate a pre-race breakfast and headed to the race site. 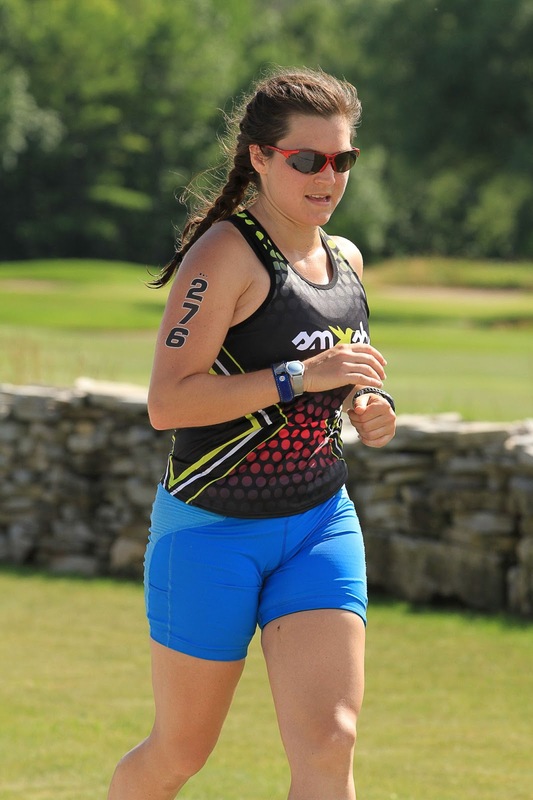 We took our time heading over to transition because we still weren't sure whether the race was happening or not. But eventually we set up in transition only to hear that they were delaying the start by 90 minutes and would evaluate then whether to start the race or not. We had the option of taking all our gear out of transition but opted to leave our bikes and just take our bags back to the truck. So for 90 minutes we waited. 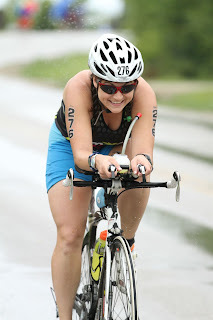 And then pretty much when we thought the race would be cancelled we heard the race would be starting with an abbreviated swim and full bike and run. So back to transition we went. Due to the rain it was pretty chilly and we stood around and shivered in our wetsuits in the water. I "borrowed" a new swim cap from a relay team member since mine was nice and dry back at the cabin. 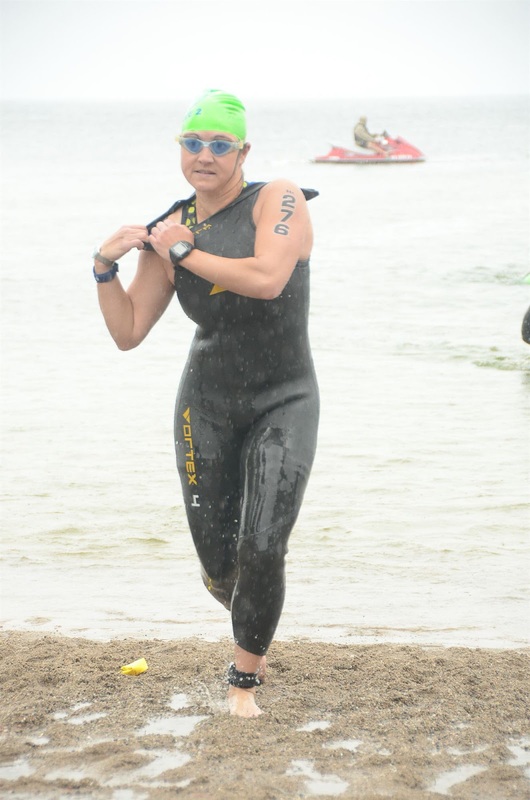 The swim was downsized from the 1.2 mile swim to the sprint course's 1/4 mile swim. Once the start for my wave went off I panicked a bit at the beginning but eventually calmed down and swam fairly okay for the rest of the swim. There isn't much to say about a 1/4 mile swim. Wetsuit strippers at the end were awesome. The bike was wet and windy. The rain was still coming down for the first part of the ride so I took corners and downhills fairly easy. The headwind on the way back was tough! I just kept in aero position and tried to keep the legs spinning without fighting the wind too much. 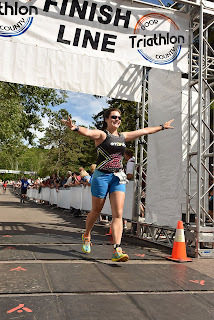 My legs didn't feel super responsive but I had a fairly big training week going into the race with no taper. I knew a PR wasn't in the cards anyways and consistent pacing and a solid race effort were my only goals. Overall the bike course is fairly boring there are a few hills but nothing I needed to get out of the saddle for. The roads are not in the best of shape and you do need to watch out for potholes. In T2, I saw Kelly for the third time during the race. I debated whether or not to take my handheld and due to the cooler weather decided to skip it. My legs, especially my very tight calves, did not feel great coming out of T2 and I thought I might be in for a long run. But I just kept chipping away at the run and took my normal approach of run one mile walk 30 seconds approach and around mile 3 I started to feel a bit better. 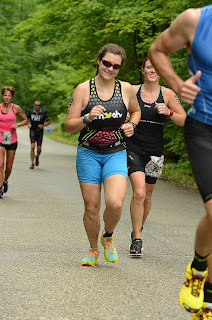 My legs loosened up enough that I could get in a good stride. 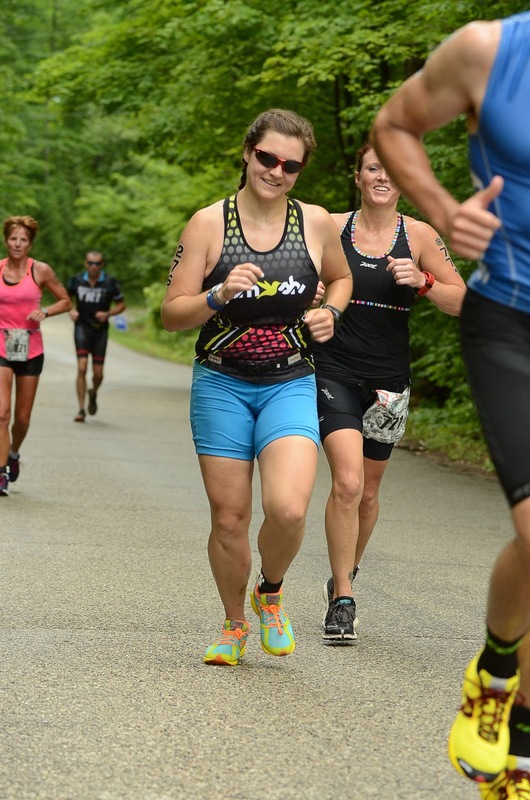 I still walked through the aid stations and up the huge hills at mile 5 and mile 9 (ouch!). When I was running I was able to maintain about 10 minute miles and I was feeling so good from about 6 to 8 that I was skipping my walk breaks. Miles 10-12 are tough because you are on the top of the bluff without any shade and the air was really heating up plus the humidity was tough. The end of the race goes back down the bluff to the lake and is a huge quad killer but I hustled down the hill and came flying across the finish! 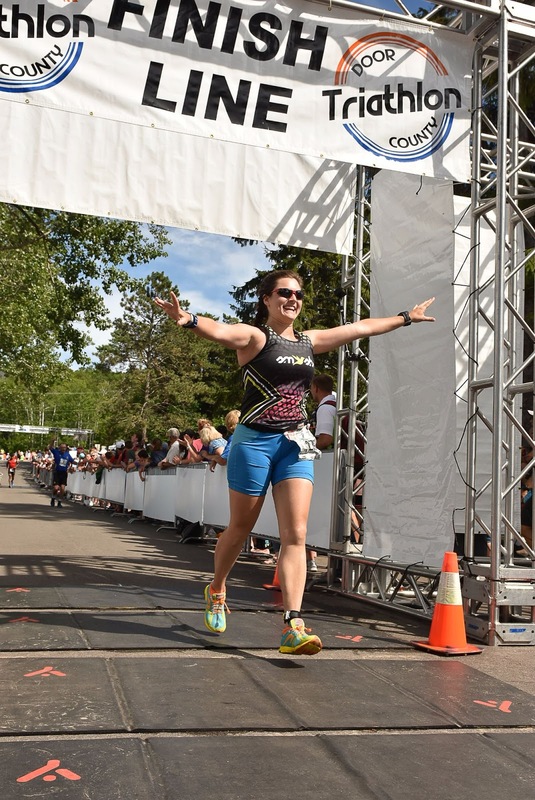 I immediately got into the cooling tub which felt awesome before I headed to pick up my medal. One of the best things about this race is the post race food. We had pulled pork sandwiches, corn on the cob and beer! The food tasted great and since we weren't in a hurry to get out of Door County on Sunday we got to sit around and enjoy the view. My run split was only 10 seconds slower than last years' split, so how is that for consistency! Would I do it again? Can't wait to do it again!